Award-winning composer Nina Shekhar was born in Northville, Michigan in 1995. She is currently pursuing graduate studies in Music Composition at University of Southern California, and previously received dual undergraduate degrees in Music Composition and Chemical Engineering from the University of Michigan. Shekhar received the 2015 ASCAP Morton Gould Young Composer Award and was a finalist in the 2017 and 2018 Morton Gould Awards. Leading artists such as ETHEL, Third Angle New Music, Tony Arnold (International Contemporary Ensemble), Kaleidoscope Chamber Orchestra, and flutists Amy Porter, Natalie Joachim, and Elise Shope Henry have performed her works. She is also mindful of social issues as can be seen in her piece Quirkhead, a work about obsessive-compulsive disorder and mental illness. The work will be featured in an upcoming PBS documentary chronicling the inaugural Gabriela Lena Frank Creative Academy of Music. Shekar is currently working on a new work for members of Eighth Blackbird for the Blackbird Creative Lab where she is also the 2018 Lewis Vilensky Fellow (1). Besides composing, Shekhar is a talented performer. She most recently studied flute with Amy Porter and previously with Holly Clemans. She has premiered fellow composers’ works at the Midwest Composers Symposium and the New Music on the Point Summer Festival. She has studied piano with Tomoko Mack and Brenda Krachenberg and has performed in the Poland International Piano Festival as a soloist with the Lublin Philharmonic. In 2012 and 2013, Shekhar was invited to perform at the Detroit International Jazz Festival as lead alto saxophonist with her jazz band. Her composition mentors include Evan Chambers, Bright Sheng, Michael Daugherty, Kristin Kuster, Erik Santos, Gabriela Lena Frank, Derek Bermel, and James Hartway (2). She will be studying with composer Ted Hearne as she begins her studies at University of Southern California. Like many children, I vividly remember my first trip to the zoo. I remember being amazed by Mother Nature, seeing the distinctive talents and features that all of her unique life forms had. I also remember my parents being annoyed at my nonstop attempts to mimic the animal sounds I had just heard — my endless moos, oinks, meows, and roars were probably not the most pleasant noises, at least not when I made them. Zoo Song is an attempt to recreate this common childhood experience. The singing flutist assumes the character of a child who is obsessed with various animals. The performer squawks and brays in a desperate attempt to be each animal, only to prove unsuccessful at the end. Many thanks to Hannah Weiss for commissioning this work and for allowing me to use the word “snort” in her piece (5). Symbolism, using representation to evoke experiences of synesthesia, became popular in late nineteenth century literature. Symbols convey imprecise meanings which can be interpreted in various ways. Ambiguity, hence, is the essential medium of the symbol. In art, the symbol becomes a vehicle of meaning that indicates direction of thoughts and feelings (3). In Zoo Song, both listeners and performers experience Shekhar’s auditory and visual performance elements that produce a synesthesia of visual, auditory, and tactile associations, and the sense of childlike wonderment. The analogies used by Shekhar express her personal experience with the external world. This dynamic work stimulates the listener’s senses to create images of the childhood curiosity and wonder that we sometimes forget. It is important to note that this work allows for a large variety of possibilities as different performers choose to emphasize different aspects of the work. In an email to the author, Shekhar says, “I love giving the performer some leeway to act out each animal in their own way because these animals are multi-dimensional and have many unique aspects to their characters, and each person recalls different experiences with these animals.” The rest of the essay is devoted to identifying and describing these elements. Zoo Song is a four-part work in which multiple creatures are described. The first three parts depict animals in pairs beginning with chicken and pig, horse and donkey, and finally sloth and whale. The fourth section closes the work by depicting the human child. Throughout the work, the performer is required to act out certain characteristic actions associated with each animal. The opening act suggests a bird-like creature, though the actual species is not revealed until bar 15. The instructions pinpoint the characteristic that the composer wishes the soloist to portray. For example, in bar 1 (example 1), the composer writes “move jitteringly with sharp, sudden movements (3).” At the premiere, Weiss started the performance with her back facing the audience, knees bent, complete with head bobs and a bird-like stare. There was no doubt that she was portraying a bird. Example 1. Bars 1-4 of Zoo, instructions for actions that suggest a bird. © Copyright 2017 by Nina Shekhar. Used with permission. ﻿The second action is not explicitly dictated but is assumed through the special notation shown in example 2. “Snort” for most people would not just entail the auditory aspect of the sound, but is also coupled visually with the head slightly cocked back, pinched nose bridge, flared nostrils, and squinty eyes – all of which are necessary to effect the composer’s instruction with conviction. Example 2. Bars 32-36 of Zoo, special notation for snort. The third animal brings us to the equine populations of the animal kingdom. Starting with the horse, the neighing effects comes with “tilt head and lean backwards and forwards as you neigh (3).” The horse section also includes directions about specific spatial movements. The performer is requested to trot to and fro as they first introduce the clip-clop motif (example 3). Hoof-stomps are also called for, further strengthening the visual association to the musical experience. The donkey follows immediately, also incorporating the stomps. A fun part of watching this performance was witnessing Weiss negotiate the bray motif (example 4) as it seems inevitable that she had to adjust her head angle to effect the wide leap, effectively evoking the image of the noisy donkey. Example 3. Bars 72-73 of Zoo, clip-clop motif and stomp. Example 4. Bars 84-88 of Zoo, braying motif. ﻿Sleepiness and lethargy enters the frame next with Weiss seeming to fall asleep mid-performance to enact the slow and sleepy sloth (example 5). Executing the pitch bends also adds to the effectiveness of the visual element in depicting the sloth. As flutists lower their head while playing, their pitch naturally lowers and the tone becomes softer and duller (3). The whale comes next with Weiss making loud jet whistles, used to represent the whale’s expulsion of expended air. Like the “snort” in the pig-section, acting instructions were not given but can be assumed are built in to the jet-whistle technique. Example 5. Bars 120-122 of Zoo, instruction to suggest lethargy and slowness. The human section uses the dramatic features in the previous six parts but focus more on emotions, rather than the animalistic behavior that the earlier actions symbolize. A discussion of the human child section will be provided towards the end of the paper. There are two parts to the auditory section. I will begin with writing about the non-traditional sounds and closing the section with a discussion on the more traditional elements. The distinction may not always be clear-cut as both elements work together to evoke perception of actual interaction with the animals. The first sounds created with extended techniques are key clicks. The opening musical instruction is “Nervously clucking (3).” For me, this not only sets the tone for the type of sound the performer would create, but also create an imagery for the movements needed in this opening. Squawks were also used in creating the chicken. A series of sforzando, accented, high-pitched flutter-tongued notes are notated to mimic the squawking fowl (example 6). The timing of the first squawk in bar 15 is aptly placed immediately after the performer reveals the identity of the first animal — chicken. I immediately feel like there were chickens running around, wings flapping and heads bobbing, making a noisy scene. Example 6. Bars 15-17 of Zoo, mimicking the squawk. Recall again, the snorting sounds in the pig section. Key clicks continue as the composer made references to the chicken while the pig comes alive. A favorite moment is in bar 43 when the pig squeals, perhaps excited with dreaming of feasts or perhaps it is a response to a nightmare (example 7). Both sections, pig and chicken, employ a similar gesture and a delayed revelation of the animal in question. The snort is deliberately placed right after the text pig in bars 35-36 (see example 2) (3). The humor is especially effectively with the cheeky silence at the end of bar 35. Example 7. Bars 41-43 of Zoo, jet whistle technique for the pig’s squeal. The neigh of the horse is depicted by the flutist singing a glissando while playing on the flute (example 8). The result is a high-pitched whinny that works well amidst the stomps and gallops to encourage imagery of the horse. The bray of the donkey is mimicked using pairs of note. Each bray begins with a quieter staccato high note that drops to flutter-tongued low notes, helping listeners imagine the pitch drop and loud honk of the donkey’s signature call (example 9). Stomps continue to help depict the equine family, though the majestic image of the horse’s stomps transform into a more comical one for the donkey. Example 8. Bar 71 of Zoo, horse neighing through singing and playing a glissando and acting. Example 9. Bars 90-92 of Zoo, braying motif with stomps. The sloth’s slow nature is partly depicted with slurred speech and pitch bends, creating a sense of lethargy that characterizes the animals slow speed (example 10). A sense of nonchalance is also felt as the flutist changes the tone quality from regular to airy across quick figures (example 11). Humor once again is used as Shekhar delays naming the sloth until bar 118. The same additive technique seen at the opening of the work is used here before revealing the sloth with an emphasis on the “s”-sound before revealing the rest of the word (3). Key clicks return in this section, though they are spread further apart from one another. The decreased rhythmic frequency and slower tempo transforms the imagery from the frenzied jittery chicken to the clicking noise that the sloth’s claws make as they grasp branches while they move. A fourth technique used here is the tongue stop, which helps me associate with the slow breaths that sloths take, or perhaps the sloth is clearing its nose after a swim (example 11). Example 10. Bars 128-133 of Zoo, speech slurs and pitch bends. Example 11. Bars 108-109 of Zoo, sense of nonchalance and tongue stop to evoke further imageries of the sloth. Using the sloth’s swimming abilities as a bridge, Shekhar shifts to the whale portion of the work. Two images are conjured here, one more auditory and the other with stronger visual imagery. The over-blow technique in bars 149 to 151 to represent the fountains created when whales spout, paired with the ingenious mimicry of whale songs, are so captivating that I almost imagined water droplets coming into contact with my skin (example 12). To replicate whale songs with the flute, Shekar employs two extended techniques. The first technique involved singing and playing at the same time, which we have already seen, used in the neighing for the horse. The effect created is distinct due to the way the technique is used (example 13, compare with example 8). The second technique involves timbral trills and overblowing to sound the harmonics (example 14). The grace and majesty of the giant mammal appear to come alive as I heard these techniques in context. Example 12. Bars 149-152 of Zoo, jet whistle as water spouts. Example 13. Bars 140-141 of Zoo, mimicking whale songs. Example 14. Bars 142-144 of Zoo, mimicking whale songs with timbral trills and overblowing. The work does not rely solely on extended techniques to be effective, traditional notation and flute playing contribute to the gestalt of the work. The opening of the work uses pitches DFGAC, and reveals little about the first animal. This is akin to the tonally ambiguous introductions that many composers of the tonal tradition use before revealing the tonal center of the work. The additive text also builds anticipation toward the reveal of the first animal. In bar 15, the performer announces the chicken with a question mark. Shekhar chooses the announcement on a foreign pitch — B — in a moment of playful surprise. This moment is strengthened with the sudden squawks that follow immediately. Chromaticism is introduced for the first time in bar 23 in the vocal line following the squawks. Descending chromatic lines by convention in tonal music can depict darkness, lament, and/or doubt. Here, I hear the mind of a child wandering off with the descending chromatic line. It is especially effective when considering the relatively tonal melody in the singing part that immediately succeed and precede bars 23-31. True to the built up expectation, the next animal is about to be revealed. The pitch material in the pig section is largely taken from the d minor scale used in a pandiatonic manner. The chromatic notes in this section almost allude to the ephemeral qualities of dreams. The full-fledged allusion is prevented by the sense of innocence from the child, derived from the simplicity of the text and general adherence to tonal materials. Ending this first section on the pitch E creates a small sense of anticipation that more music is to follow. Example 15. Bars 54-57 of Zoo, whoosh effect to depict a fast animal. After a brief fermata, a flurry of notes in an ascending motif, with increasingly larger interval leaps through the ascent leads me to think of a fast animal. This is based on observing the first note of each set of sextuplets. The clip-clop motif and whoosh effects (example 15) strengthens the probability that the child is reminiscing about a rapidly approaching beast. Unlike the previous two animals, the first time the horse is revealed is done in passing. The quality of running is emphasized rather than the animal itself. The increasing excitement is created with the use of an ascending chromatic line in bars 78-80, leading to quick gallops and a breathtaking arrival moment in bar 83. The imagery here perhaps suggests a valiant leap into a gap between two cliffs, with a triumphant whinny at bar 84 to finish up the child’s dream about being a horse (example 16). Example 16. Bars 75-84 of Zoo, depicting the horse’s gallop and abilities in speed. © Copyright 2017 by Nina Shekhar. With both donkeys and horses belonging to the same family (equine) and sharing many characteristics, Shekhar introduces contrast with the single defining feature of the donkey — its bray. A transformation of the clip-clop motif in bar 96 uses smaller interval leaps, which helped me imagine the smaller stature and more comical physical proportions of the donkey. The gesture is repeated in bars 100-101 (example 17b). Chromaticism in the vocal part provides a feeling of inner turmoil within the child. The first time the child proclaims to want to be a donkey seems unsure or uncommitted and the descending chromatic line helped depict that feeling (example 17a). The next two claims descend a step but ascend two steps, which appears more self-assured. (example 17b). The reiteration of this gesture, and the use of accents and stomps, confirms that the child does indeed want to be a donkey (example 17b). Example 17a. Bars 92-95 of Zoo, sense of lesser commitment to being a donkey. Example 17b. Bars 98-103 of Zoo, wanting to be a donkey with more surety (voice part). Also showing the transformed clip-clop motif (flute part). The ending bars of the donkey part use a descending chromatic line and a well-placed ritardando, to slow the pace into lethargy. Perhaps after all the exertion with rapid animals, the child is feeling tired. Hence the sloth enters the frame. The consistent use of descending lines helps me imagine the laziness and drowsiness that are most commonly associated with sloths. Whenever the flutist returns to a higher tessitura to execute the next descent, it almost feels like sudden burst of energy much like the sudden jerks of the neck we all experience when dozing off. In bars 134-135, the upper chromatic neighbor motif signals a moment for change (example 18). Shekhar transitions to the whale using the swimming skills of both animals. In previous sections, the singing part and the playing part may sound relatively fragmented. 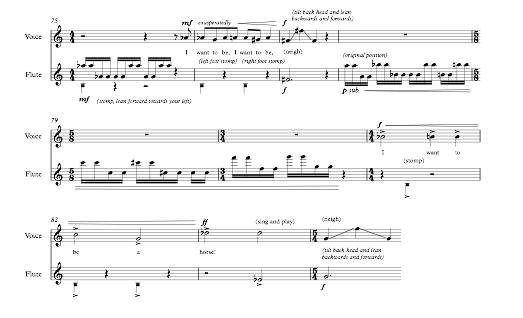 Here in the whale section we have a descending vocal line connecting to an ascending simultaneously sung and played line to give a feel of larger phrases. This may help create the massive size of whales in contrast to the five animals described earlier. The return of the upper chromatic neighbor motif from bar 142 helps build tension and leads to the arrival at bar 153. This section is the whale diving in preparation, building momentum and increasing its speed and depth before performing a vertical ascent, or breach (see example 12 for the buildup). The awe and adrenaline that come from witnessing a breach is fully felt in the fortissimo rapid figures and subsequent harmonic trills (example 19). The fermata freezes the image of the breach for the audience to fully grasp the epic moment. Example 18. Bars 134-137 of Zoo, upper chromatic neighbor motif. Example 19. Bars 153-157 of Zoo, the breach and descent from the air. Who will ever know the secret of musical composition? The sound of the sea, the curve of the horizon, the wind in the leaves, the cry of a bird — all these arouse in us a number of impressions. Then, all of a sudden without our willing it in any way, one of these recollections assumes an outward form and expresses itself in musical terms, clothed in its own harmony, which could never be improved however hard one might try. It is only in this way that a heart destined for music makes its finest discoveries… I loathe doctrines and their impertinences. That is why I wish to write my music dream with complete detachment from myself. I want to sing my interior landscape with the naïve candor of a child. This will always shock those who prefer artifice and lies (3). In the final part, the human child faces a crisis when he/she realizes that he/she cannot become the animals as imagined. The music becomes frantic as Shekhar chaotically presents all the elements that were earlier used to depict each animal. Fragments of spouts, gallops, neighs, snorts, squawks, etc. are presented randomly to show the exasperated child trying to reconcile the fact that it is impossible to become any of the creatures. Within the chaos, the child “says goodbye” to each animal with one of the extended techniques that was earlier associated with that animal. Hilariously, Shekhar omits the pig in this series of realizations. Perhaps we can be pigs. The infamous snort does return though in bar 207 as the child begins to repeat the words “I can’t” with increasing frustration. Snorts and brays end the section of anxiety. The final measures of the work begin with a sprechstimme of the words “so maybe I’ll just be me.” This first statement is in a defeated tone with a descending melodic contour. The second statement sounds less disappointed as actual pitches are introduced, though the line is descending. The next few measures are uplifting, with a sense of hope as the melodic line in the voice part is set over an ascending chromatic line. The interjecting flute lines add to the dreamy character. After the sustained word “dream,” Shekhar ends the work cheekily with a final reference to the chicken with a tremendous squawk. The reference to dreams and chicken (the first animal in the piece) also help bring the work to a comfortable conclusion. The consistent use of visual and auditory gestures to create animal characteristics unifies the work conceptually. The strong associations between the musical and imaginative experiences can also potentially be seen as leitmotifs. For example, regardless that in the final child section squawks, snorts, brays, etc. are not necessarily placed next to the animals that they represent, experiences associated with any particular animals are still evoked. The cacophony in the human child section hence serves as a finale of sorts through these associations that are planted in the listeners’ minds as we pick out gestures that we recognize from earlier parts of the work. Shekhar’s use of pitch materials (chromaticism, pitch collections and their foreign notes) and humor likewise ties the work together. What do you know about chickens? Chickens can lay two hundred eggs a year. I want to be a chicken. I want to dream like chickens. I want to be a horse! What do you know about sloths? They sleep for fifteen hours at a time. I want to sleep like a sloth. But whales can swim even better. I want to spout like a whale! I can’t spout like a whale. The level of thinking suggested by the text seems to correspond to intellectual abilities of a young child. The descriptions are mainly factual and are observations that are immediately obvious (3). There is a sense of fickleness in the text, driven by excitement and curiosity towards each animal. Shekhar highlights the child’s young age with the juvenile logic in the protagonist’s comparisons. For example, the child compares the horse’s athletic prowess to the donkey’s vocal strength in the equine section and decides that the donkey is the new favorite. The child’s disappointment with not being able to completely morph into the various animals is captured through the frantic rhythmic density, frequent leaps, seemingly chaotic mixture of extended techniques and traditional sounds, and driving chromaticism in the fourth part of the work. In putting together the work, Shekhar chose to complete the text before filling out the musical elements in Zoo Song. This is different than her usual process of working on text and music simultaneously when she writes her own texts. Her research included listening to field recordings, learning simple facts about each animal, and exploring children’s books to compose a text that is immediately and easily relatable to children (and those of us who are children at heart). The parallel structure in the text reinforces the juvenile and innocent qualities that young children naturally possess (3). One example is the text “What do you know about [animal name]” which is used in the both the chicken and sloth sections. Another example of parallelism is in the phrase “I want to be a [animal name],” which appears at the end of almost every section. On a larger scale, almost every portion of the piece begins with a question, a simple fact, and the declaration of wanting to be the animal(s) being represented. There is a small exception in both the donkey and whale portions, where the switch (to a different creature) is executed with a “but” statement that brings up a quality that it is unique to itself. The section of “I can’t” sentences quickens the pace of the text and serves as a recapitulation of previous sections. This helps consolidate the work as a whole. It is necessary for the performer of this work to recall memories of interactions with animals as a young child. The externalization of these memories requires imagination too, in order to produce a logical presentation of the at-times-illogical thoughts of the young child. The mannerisms in the acting, and the mannerisms brought about by creative execution of the musical materials also require the sentimental transformation of what is invisible within those memories. The listener as well, is taken on a journey of imagination, enabled by the composer, provoked by the performer, and evoked by the self, as explained throughout this essay. Nina Shekhar, “About,” Nina Shekhar, Composer, accessed March 9, 2018, ninashekhar.com/about/. The video recording of the world premiere can be accessed at http://ninashekhar.com/zoo-song/ and http://www.hannahweissflute.com/media/, accessed April 5, 2018. Hannah Weiss, interview by Chee Weng Yim, Miami, February 8, 2018. Nina Shekhar, “Zoo Song,” Nina Shekhar, Composer, accessed March 9, 2018, ninashekhar.com/zoosong/. Stefan Jarocinski, Debussy: Impressionism and Symbolism (London: Eulenburg Books, 1966), 23-25. Nina Shekhar, Zoo Song, 2017, 1. Nina Shekhar, e-mail message to author, May 29, 2018. Stefan Jarocinski, Debussy: Impressionism and Symbolism (London: Eulenburg Books, 1966), 96. Susan C. Nurrenbern, “Piaget’s Theory of Intellectual Development Revisited,” Journal of Chemical Education 78, no. 8 (2001), 1108. Jarocinski, Stefan. Debussy: Impressionism and Symbolism. London: Eulenburg Books, 1966. Sources, Contexts and Legacies: Essays in Honour of François Lesure, edited by Babara L.
Kelly and Kerry Murphy, 117-148. Burlington, VT: Ashgate Publishing Company, 2007. Chemical Education 78, no. 8 (2001): 1107-1110. Shekhar, Nina. “About.” Nina Shekhar, Composer. Accessed March 9, 2018. Shekhar, Nina. “Zoo Song.” Nina Shekhar, Composer. Accessed March 9, 2018. Shekhar, Nina. Zoo Song. 2017. Weiss, Hannah. Interview by Chee Weng Yim. Miami. February 8, 2018.